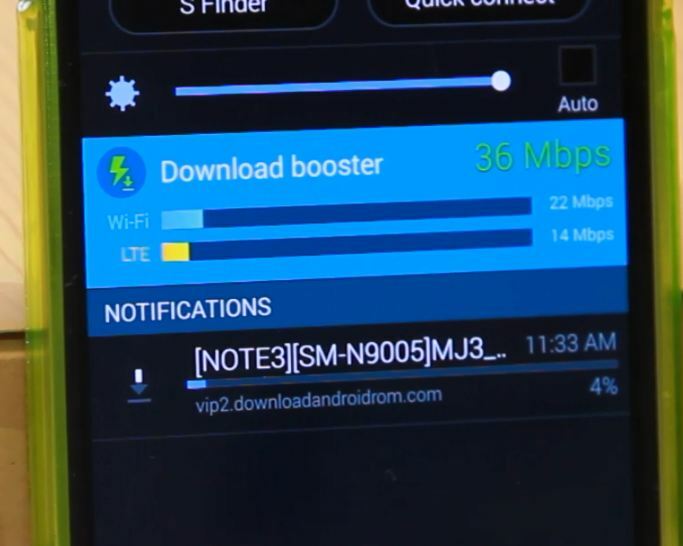 Download Booster, just like as the name implies, boosts your download speeds for large files (for videos, music, and even custom ROMs) by using both your WiFi and 4G LTE networks at the same time! This is pretty incredible as you cannot do this on any other device “right now”, not even on your desktop computer. There are ways to do something similar using multiple WiFi networks on your computer but nothing close to using both WiFi and 4G LTE. Why do you need Download Booster? Perhaps you want to download that presentation video from your work computer but you have an important presentation with clients in 10 minutes and you forgot to copy the video to your computer. You could probably use just a fast WiFi or your 4G LTE and download that large presentation file but what if you could use both? It could possibly save your job. I personally download many custom ROMs on a daily basis with each custom ROM averaging over 1GB each. This is going to allow me to download at the fastest possible speed, saving me a ton of time. Now, this feature is available for most Galaxy S5 except for some U.S. carriers like Verizon and Sprint. But don’t worry Verizon/Sprint users, we will figure out a way soon to do it also, check GalaxyS5Root.com for updates on that. Also, if you are downloading super large files, make sure you have unlimited 4G LTE. I have grandfathered unlimited 4G LTE on both T-Mobile and Verizon, so I can take advantage of this on a daily basis. How to use Download Booster? In our test with 18Mbps download speeds on my WiFi and 16Mbps download speeds on my 4G LTE, I was able to download 1.6GB file in about 7 minutes, around 36% faster than downloading on my WiFi alone. Now, if your WiFi or 4G LTE is faster, you can expect even better results. HighOnAndroid Facebook Page <--- If you like this post, please Like Our Facebook Page Here, thx!